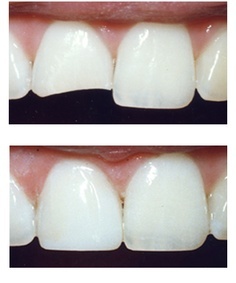 Teeth bonding is one way to improve the look of your teeth and get a beautiful smile makeover. The reason why it’s called teeth bonding is because the procedure is done by bonding liquid composite resin over the teeth. This resin material is designed to look very much like real teeth. It can therefore mask flaws like chips, cracks and discoloration. It can also be used to reshape the size of a tooth. Leading dentist in Atlanta, GA, Dr. Jeffery Ballard, talks about teeth bonding facts in this article, so you can make a well-informed decision about this treatment. “What dental conditions do teeth bonding address?” is one of the most frequently asked questions about teeth bonding. Here’s what dental bonding can do for you. It can alter the shape of your teeth. It covers tooth flaws like stains, chips and cracks. It closes gaps between teeth. The resin material can be used to fill a decayed tooth; thus, making it a good dental filling option. What Happens During the Teeth Bonding Procedure? 1st Step – Your teeth are prepared for the procedure by roughening their surfaces with the use of a conditioning liquid. This is done so that the bonding material adheres well on your teeth. 2nd Step – Once prep work is done, the dentist applies the liquid composite resin over your teeth. He molds and sculpts the resin material, to achieve the desired shape and appearance. 3rd Step – The dentist then exposes your resin sculpted teeth to a special light. The light cures and permanently bonds the resin material over your teeth. 4th Step – The dentist makes final touches. He trims and removes excess bonding cement. He then polishes the bonded teeth for a gleaming white effect. Your teeth are now beautifully transformed in as little an hour’s treatment time. Why Should I Choose Teeth Bonding over Other Cosmetic Dentistry Options? There are many reasons why teeth bonding is a great option. It is a simple procedure that often requires no anesthesia. Dental anesthesia is only necessary when teeth bonding is used to repair decayed teeth. It is a fast, easy treatment. Treatment time is from 30 minutes to an hour for a single tooth. Teeth bonding is oftentimes completed in a single office visit. It requires the least amount of enamel removal. It, therefore, maintains as much tooth structure as possible. It is an inexpensive cosmetic dentistry treatment. Dental bonding cost ranges from $100 to $400 per tooth, depending on your area. How Are Bonded Teeth Maintained? Maintenance of bonded teeth is pretty simple. All you need to do is to practice a good oral hygiene routine and to visit your dentist periodically. A good hygiene routine involves daily tooth brushing and flossing. Brush after meals and floss at least once a day. See your dentist every six months so he can monitor your bonded teeth and the condition of your dentition. Since the resin material bonded on your teeth is not entirely indestructible, you are also advised to avoid habits that involve biting hard objects. Refrain from biting your fingernails, chewing ice, and using your teeth as a manipulative tool. Do wear a mouth guard if you habitually clench or grind your teeth. Keep in mind that you are not supposed to bite objects other than food. For more teeth bonding facts, visit us, at Buckhead Dental Partners. Let’s talk about teeth bonding and how this treatment can help address your needs. Call us at (404) 261-0610 or schedule your appointment online.